We thoroughly enjoyed a tour of Sri Lanka earlier this year. Unfortunately our visit coincided with the wettest January Sri Lanka has ever seen but that didn’t dampen our enthusiasm for the food. In some parts of Sri Lanka (where the Tamil population live) the food is South Indian so traditional favourites like Dosa and Idli are on the menu. 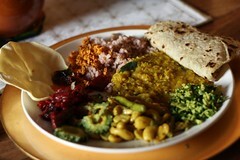 However, in the rest of Sri Lanka the food is noticeably different from South Indian. It shares lots of ingredients but they’re combined differently and are somehow reminiscent of Thai food but with Indian elements. It was very easy to be vegan in Sri Lanka and ever since we came back I have been threatening to recreate some of the food we enjoyed there. Over the Easter weekend we had a guest and I decided that the time had finally come. I bought Peter Kuravita’s book when we came back. It’s the first non vegetarian book I’ve bought for at least 20 years and it’s a beautiful book with far more than just recipes, but you might want to see if your library has a copy before you buy. All the dishes below are taken/adapted from his book unless I say otherwise. I decided that if a job was worth doing it was worth doing properly, so I went a bit overboard and put together 10 dishes. One of my absolute favourite things about Sri Lankan food is the sambols. They’re not like South Indian chutneys at all. Some are dry, some wet, and they’re generally very spicy. They’ll often have Maldive dried fish in but I substituted smoked salt with great success. 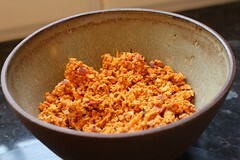 This is Pol Sambol, a dry, spicy, coconutty sambol which turned up with most meals. It’s totally addictive and was the runaway success of the meal. I also made a seeni sambol which is wetter and also delicious. Mallung/Mallum also turned up at most mealtimes and again we loved it. 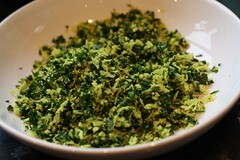 Peter Kuravita’s version uses flat leaf parsley instead of the Sri Lankan herbs and it worked amazingly well. 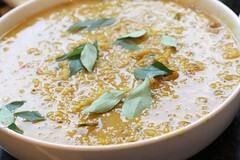 Dhal was also very popular and we tried many varieties for breakfast, dinner and tea. It was mostly red lentil though, and a bit thinner than I’m used to. 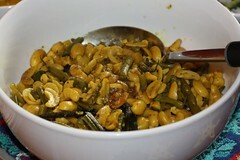 One of the dishes we really loved that must be particularly Sri Lankan is Cashew Curry. We had this a few times and it was rich and spicy. I used a recipe from Rick Stein’s series about South Asia. It involved roasting and grinding a spice blend and lots of other flavours so I imagined it would give a bigger punch of flavour than it did, but it was still very tasty and reminiscent of the versions we ate. Another favourite was beetroot curry. I’ve long thought that curry is the best way to eat beetroot and this version proved my theory again. Bitter gourd is one of Matthew’s favourite vegetables and we had an amazing version where it was thinly sliced, deep fried and sprinkled with chaat masala. Unfortunately the way I tried to recreate it from memory didn’t get rid of enough of the bitterness so although we enjoyed it I think it would have been too bitter for almost anyone else. 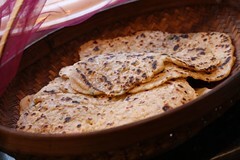 Roti in Sri Lanka is generally a bit thicker than its Indian counterpart and usually has coconut in it. I used a version from Madhur Jaffrey which was annoyingly vague about the water measurements but came out fine. Just to round out the meal I cooked some plain red rice and some poppadoms. Rice is generally served plain in Sri Lanka so that the curries stand out (it’s always called rice and curry by the way, NEVER curry and rice). We ate some amazing red rice that was grown on the property; this was just from a bag but it was tasty. Finally, to my great delight, poppadoms always appeared in the evening. I can (and did) eat my bodyweight of poppadoms with sambol. I really had a fun day cooking all this and I enjoyed leftovers throughout the week, for breakfast mostly. Just a note on ingredients. Many of the ingredients I used are widely available but I’m lucky enough to live near a South Indian shop for fresh curry leaves, bitter gourd, chaat masala, red rice and raw poppadoms. I also buy bags of frozen grated coconut there which are brilliant and the next best thing to fresh, which I never have success with. The only ingredient I had trouble with is used widely in Sri Lanka – pandan or screwpine, but the lovely Kip sent me some from London and it froze well. I can highly recommend giving Sri Lankan food a go. 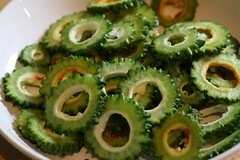 It isn’t Indian, nor Thai, but has its own distinct flavour and deserves to be better known here. What a cool food tour of Sri Lanka! Those dishes are all gorgeous and I’m sure just as delicious. Wow Liz that is an impressive compilation! What really great dishes. I live in Poland the land of beetroot and barszcz. 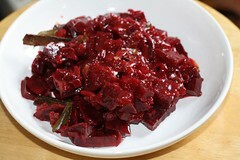 I agree that beetroot curry is a wonderful way to use beetroots. Works well with coconut milk too. I am so impressed with the recipes and dishes you have on your blog. Really inspiring.